Virtual Walks Too far away to visit? Don't want to go out today? I've done it for you. Warning! 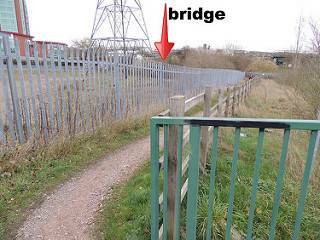 - The following access details were correct at the time of my walk - but may have now changed. Visit the Lichfield & Hatherton Canals Restoration Trust web site to find out about the Trust that was formed in 1988 and is a registered charity. 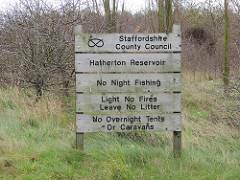 It campaigns for the restoration of the "Lichfield Canal" (as the closed section of the W&E between Ogley and Huddlesford is now called) and also the Hatherton Canal through the Cannock / A5 area. It promotes the restoration as public amenities for boating, angling, walking, cycling etc. and raises funds to carry out physical restoration work. Warning! - This route has been long derelict. Remember that this route should not be thought of as a public right of way. Most importantly, note that breaking a leg in the middle of nowhere is hazardous to health. The Cannock Extension Canal was opened to the Rumer Hill Junction from Pelsall Junction in 1858. 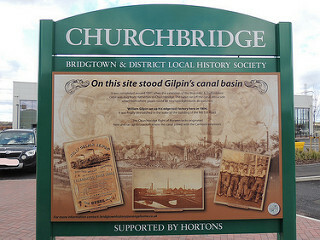 It was extended to Hednesford by 1863 when the Churchbridge Branch Canal opened a link to the Staffordshire and Worcestershire Canal via its Hatherton Branch Canal. 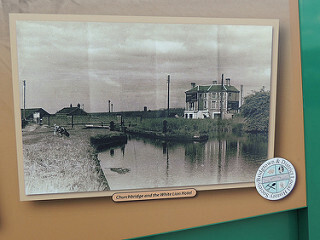 By the early 1960s long term severe mining subsidence resulted closure of the majority of the Cannock Extension and the whole of the already defunct Churchbridge Branch. For most redundant canals the lines were left to slowly fade away but coal ensured that this area was obliterated by opencast mining. From "The Cannock Chase Coalfields and its coal mines"
.. From the Churchbridge islands bounded by the A5 Watling Street and A460 Eastern Way. The later Kingswood opencast (1978-1987) wiped out a further section of the Cannock Extension. This is the most Virtual of my "Virtual Walks" and has been greatly helped by the National Library of Scotland who offer "This application that allows a set of historical map overlays to be viewed (against current maps)". Without this impressive research tool identifying long lost routes is unreliable or almost impossible. I have been able to check some of the pointers used below but there are many that are imposible to check and may be inacurate! The site of lock 5 is under the Finning CAT building. Lock Bridge between locks 5 and 4 would have been level with the back wall of the building. 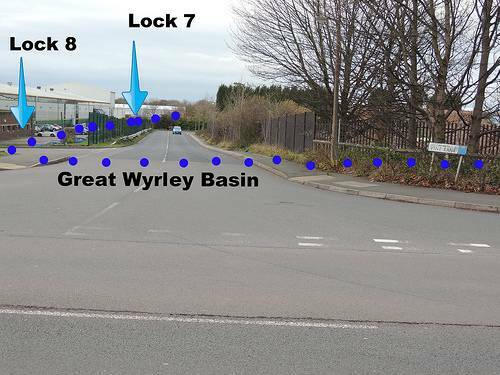 The remaining locks running up to the Rumer Hill Junction on BCN Cannock Extension would have been under the landfill mound. This photo taken from Orbital Way looking north - 22/2/2016. The site of lock 6 is under the Briggs Equipment car park. The site of lock 7 is under the white Briggs Equipment building. This photo taken of Orbital Way running south-east - 22/2/2016. 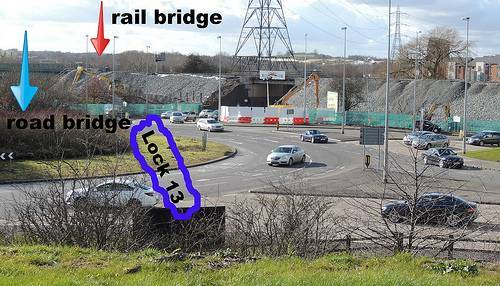 Lock 8 would have been under the access road Gemini Drive at the rear of the Orbital Retail Park. This photo looking towards Gemini Drive - 22/2/2016. Taken at the site of Lock 10 at the side of Argos (unit 8) of the Orbital Retail Park. 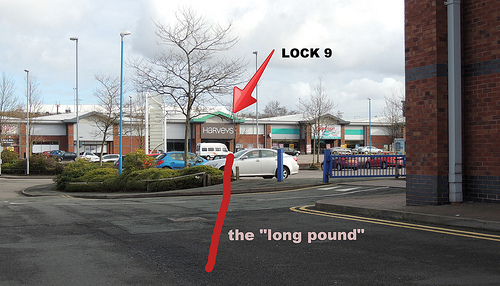 Ahead is the "long pound" leading to Lock 9 that would have been under Harveys (unit 5) of the Orbital Retail Park. This photo looking north-east - 22/2/2016. 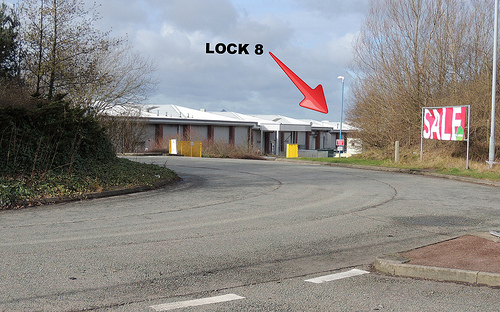 The site of Lock 10 at the rear corner of Argos (unit 8) of the Orbital Retail Park. 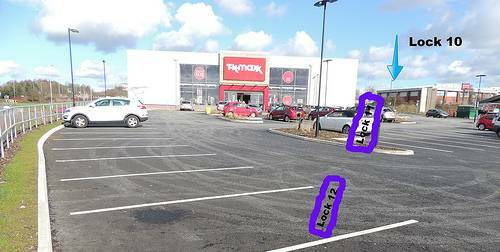 This photo taken from the entrance to Gateway Retail Park looking north-east - 22/2/2016. On the new (2015) Gateway Retail Park looking north-east. Locks 12 and 11 would have been in this car park. 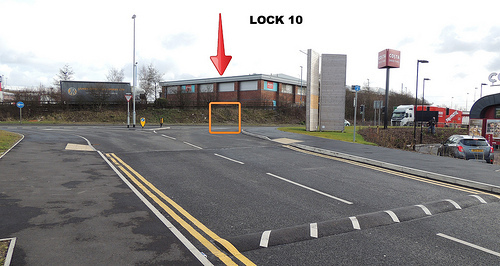 Lock 10 would have been across the A460 and the corner of Argos, Unit 8, Voyager Drive, Orbital Retail Centre. Taken looking north-east - 18/2/2016. .. They have all been involved in obliterating the original canal route here. The "Church Bridge" is lost under this major island. Lock 13 at the start of the Churchbridge flight up to the Cannock Extension Canal would have straddled the island and roadway. Taken looking south-west from the new (2015) Gateway Retail Park overlooking the "Churchbridge Interchange" - 18/2/2016. CB180 "Church Bridge" at A5 Watling Street / A34 Walsall Road junction - Also known as "Cannock Road Bridge"
that includes this image looking south-west --- just after the lock the canal passed under the sharply forked junction of Watling Street and Walsall Road. The building on the right hand side of the photo is the White Lion Hotel public house (on the far side of Walsall Road at its junction with Watling Street). To the left of the White Lion and partly hidden by it are the three bridges that take Old Mill Stream, the canal and Watling Street under the railway embankment. photo taken at the Gateway Retail Park - 22/2/2016. The A5 - canal - Old Mill Stream - A460 - M6toll. The canal and mill stream would have passed under the railway via a double arched bridge behind the pylon and followed the line of the current footpath and then along the border of the A460/M6toll (off to the right of the photo). Taken looking east from Lakeside Boulevard - 2/12/2015. 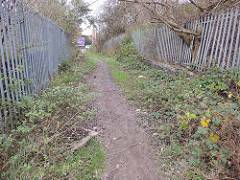 Left --- Footpath with the railway embankment to the right and the A5 straight ahead. Right --- The canal and Old Mill Stream passed under the railway via a double arched bridge. A foot bridge immediately passed over both. The canal and mill stream would have passed to the right of the pylon and followed the line of the current footpath and then along the border of the A460/M6toll. The current footpath runs from the A5  alongside the A460/M6toll  over them  over the proposed route of the new section of the Hatherton Canal - joining on to Littlewood Lane. At about (https://www.google.co.uk/maps pointer ---- 52.6716, -2.0302) the canal would have turned a little north, passing to the north of the current buildings at Lakeside Business Park / Lakeside Plaza, Walkmill Way. The feeder from the Reservoir connected to the Hatherton Branch via the spur to Hawkins Basin. Taken looking east from the Mill Lane / Hawkins Drive / Coppice Lane island - 2/12/2015. The bridge over Mill Lane / Walkmill Lane was slightly to the left of the photo. 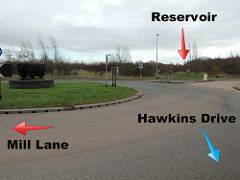 Further to the left were the spur to Hawkins Basin and the feeder from the Reservoir beyond the A460/M6toll. The canal went forwards between Vine Lane and the large building on the left. 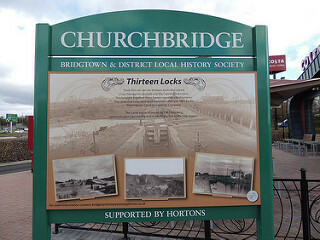 Lock 8  "Bridgetown Lock" would have been near the front of the building and Lock 7  "Rosemary Lock" near the back of it. Great Wyrley Basin would have straddled Vine Lane and extended into the yard to the right. Taken looking west from the Mill Lane / Walkmill Lane - 2/12/2015. Hawkins Drive was named in memory of the now lost Hawkins Basin. The basin was actually alongside Mill Lane from the current A460 and the eastbound M6toll carriageway stretching on to the current waterway that will eventually become the line of the new Hatherton Canal. At the site of Wedges Mill Bridge crossing the A4601 Wolverhampton Road. 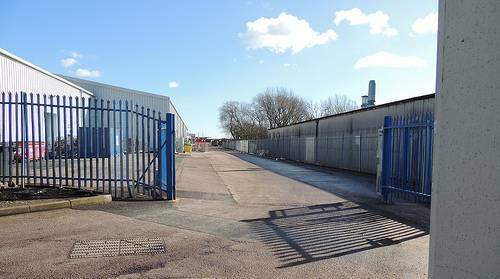 Looking east at the back of the Linkway Retail Park. Lock 4 - Wedges Mill Lock to take the canal down under the bridge would have been over the photographer's right shoulder. The line of the canal back to Churchbridge would have followed the footprint of the building to the right. Taken looking east from the A4601 Wolverhampton Road - 18/2/2016. Wedges Mill Bridge under the A4601 Wolverhampton Road. Taken looking north along the A4601 Wolverhampton Road towards the A5 - 18/2/2016. From here the old route will be reused by the LHCRT "Hatherton Canal" ---- so hop over to http://www.thehodgkinsons.org.uk/wyrley-walk7.htm where the rest of the line to the Hatherton Junction on the Staffordshire and Worcestershire Canal is described. © David Hodgkinson 2000-2016. All rights reserved.